Wishlist before the world ends. 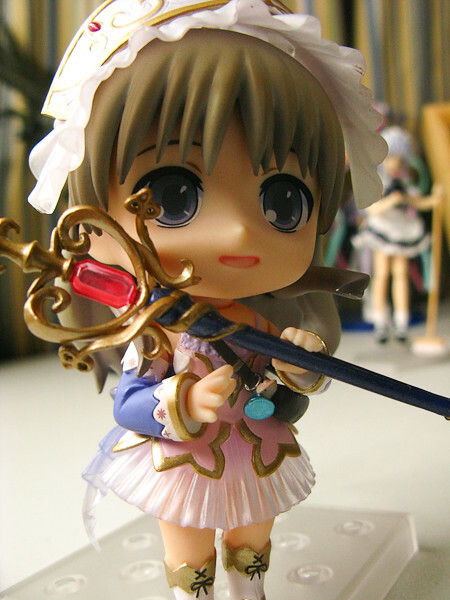 Totori came from the “Atelier Totori” game which came from Gust, who were the same people who made the Ar Tonelico series. 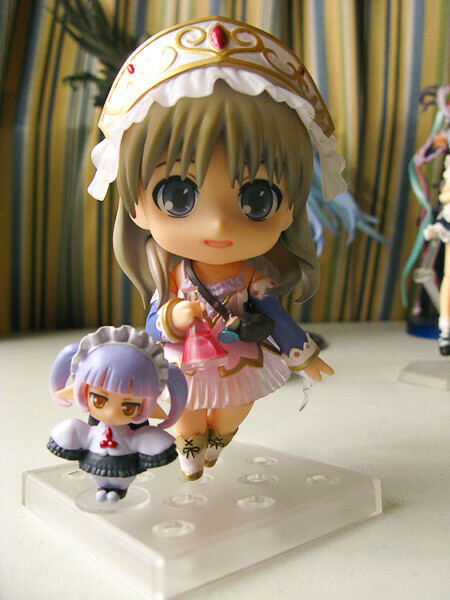 Atelier Totori is a sequel from Atelier Rorona. 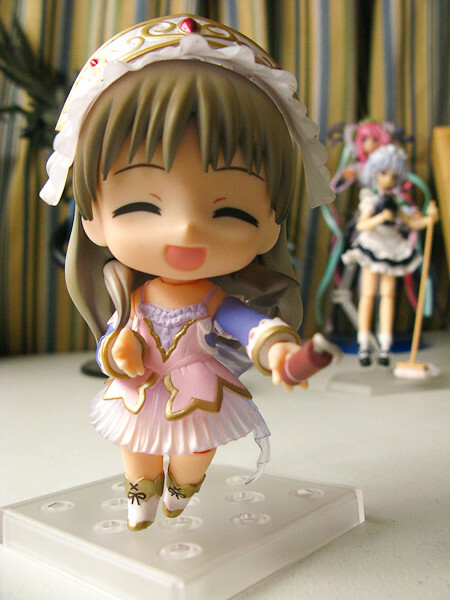 I really don’t know her relationship with Rorona or the character that will come after her (Meruru), but suffice to say that the Atelier series has charming characters that GSC wouldn’t mind giving some of them the nendo treatment (Meruru will get a nendo or petit treatment as far as I know). Mel Kishida’s drawings totally brings out the innocent feminine side in his drawing of underage girls XD. 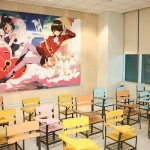 Mel is the illustrator who is responsible for Hanasuku Iroha and Kami-sama no Memo-chou just so you guys know =P. Anyway, on to the review. The box looks something from the Atelier series with all the intricate designs and the gold-periwinkle combination makes it truly Totori. 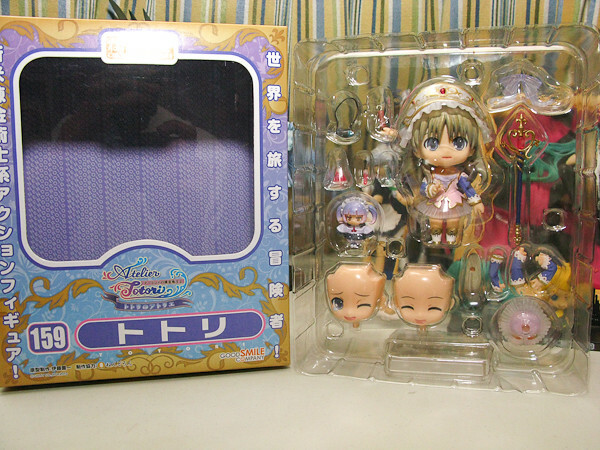 I have issues with some of GSC’s packaging designs, but they’ve been doing a good job lately. 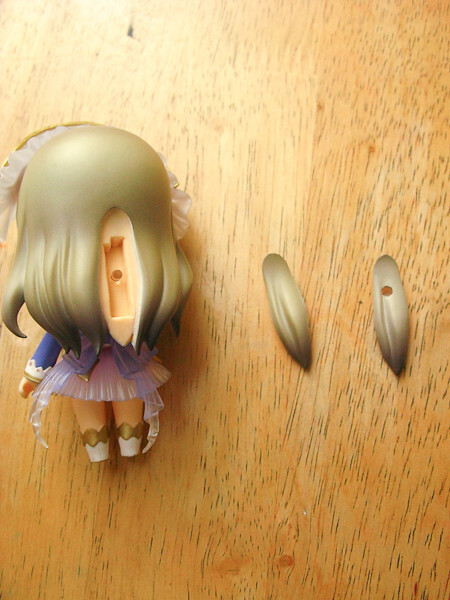 The figure also doesn’t come with parts that is just inside a soft plastic package (like the Toko Amano nendo hands). 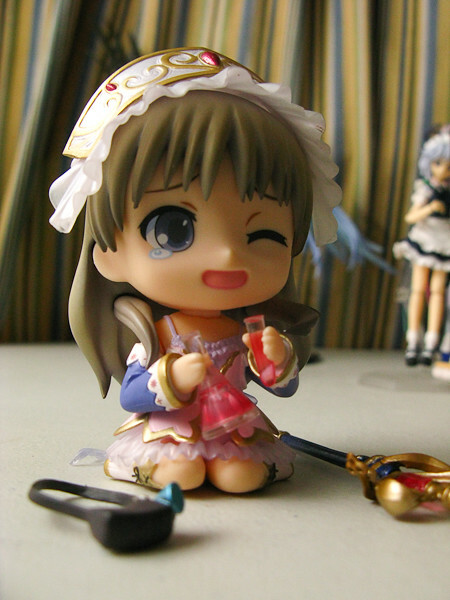 At least the chances of losing parts with this nendo is pretty slim, minus the test tubes. 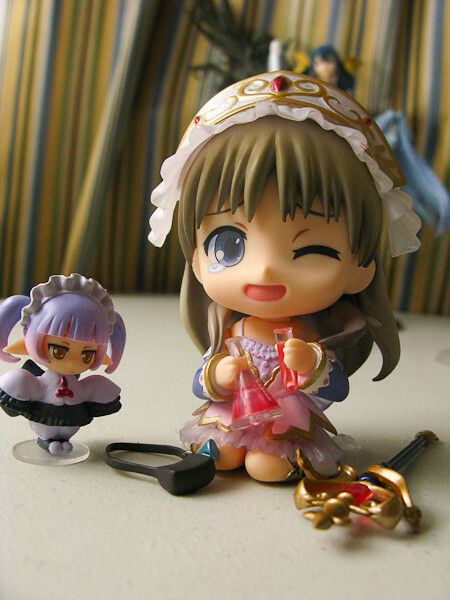 The biggest charming point in this figure for me is the smoked soft plastic parts (her head gear and skirt). 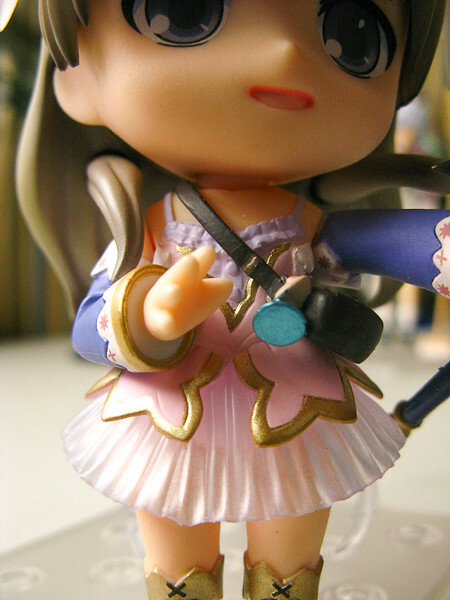 It makes the entire clothing of nendoroid appear soft as if the fabric of the actual character’s clothing is that delicate as if it were made off soft silk. If it were made of just white plastic, I probably wouldn’t but the figure at all. 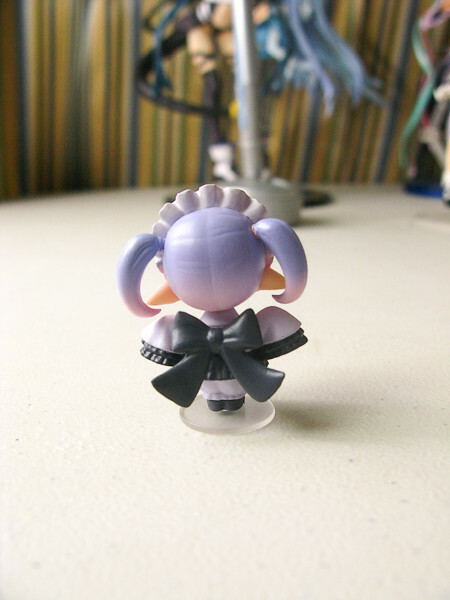 Even the removable ribbon at the back is made up of soft plastic as well. I’ve noticed that GSC has been using the square base more often than their circular base now. 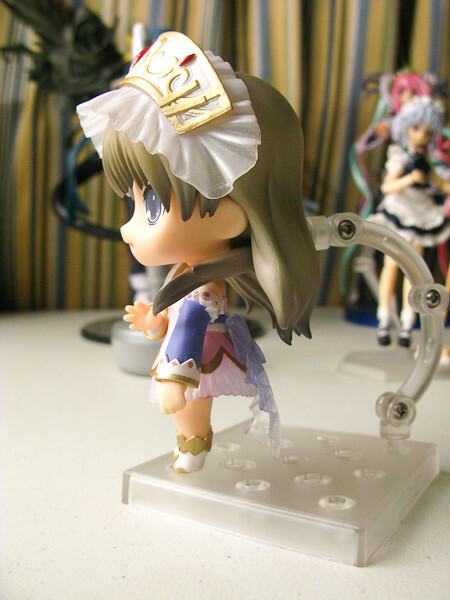 I guess that clamp at the back helps out a lot in the poseablility of the figure. I have issues with the hair parts that flow down her shoulder, This kinda limits poseability of the arm parts and only her left side hair has limited movement, her right side cannot be moved I think. Oh in case you were wondering why her hair looks funny, that’s because a part of her hair is removable. 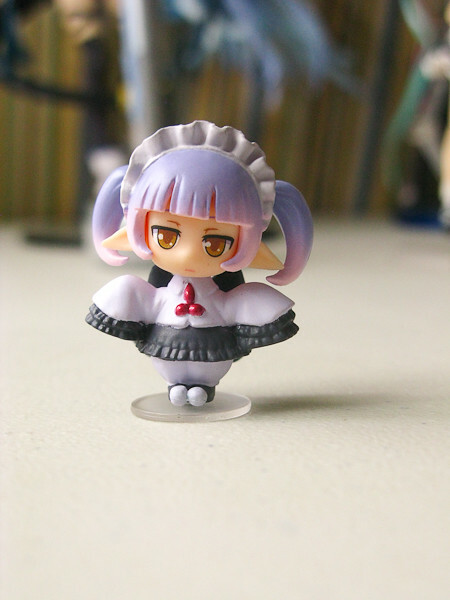 You can opt for a nendoroid that doesn’t have any peg on her, buuuut you’ll prolly be bothered by those seam lines there. 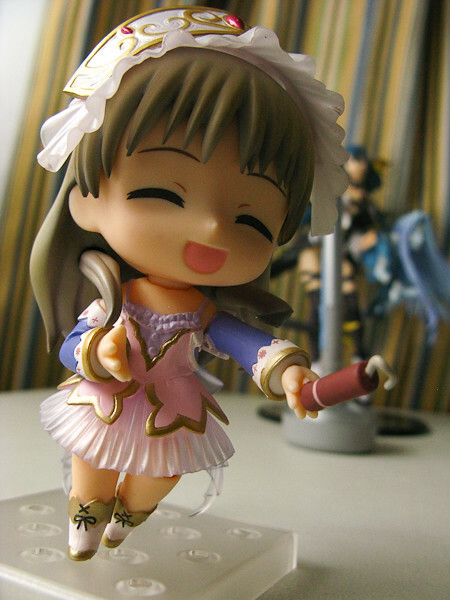 I think GSC should’ve just placed the peg behind her or just used a clamp instead like the one that Saber Lion uses. It’s a love it or hate it feature. 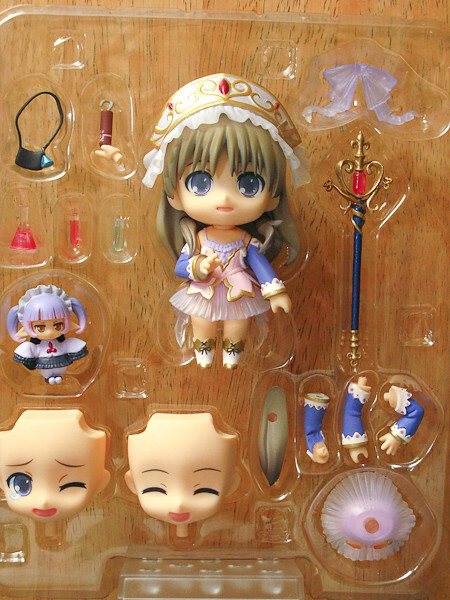 She also comes with other accessories to help her in her atelier duties like that magic staff and her bag of items. 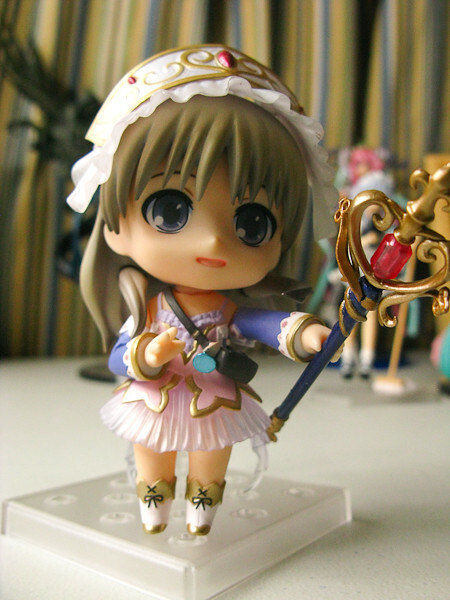 Love the intricate design on her staff plus the candy drop looking jewel affixed to it. Reminds me of Saber’s color scheme. 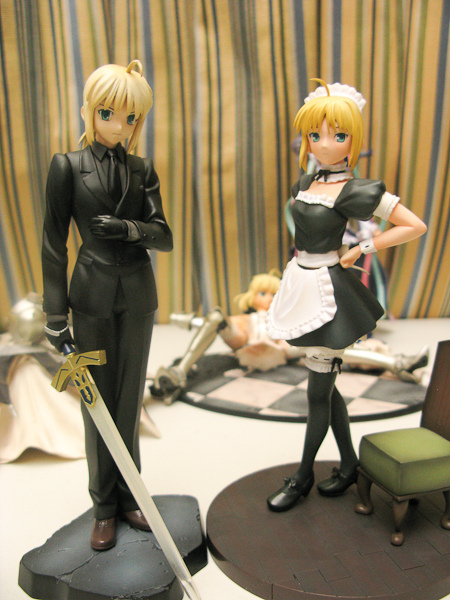 I bet if you make Saber hold that staff it might look awkward from the start, but you’ll get used to it quickly. 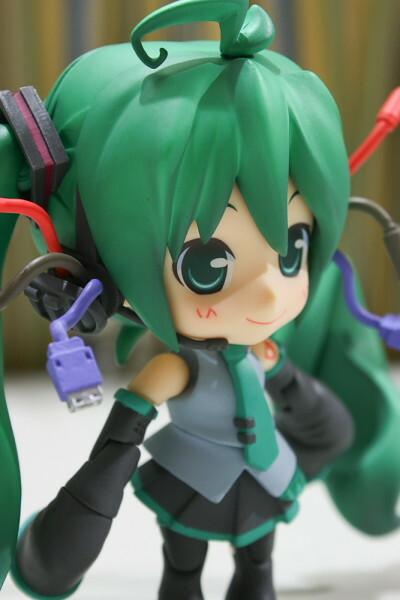 She also comes with a smiling cheerful face with a dynamite item plus hand parts to hold the dynamite properly. 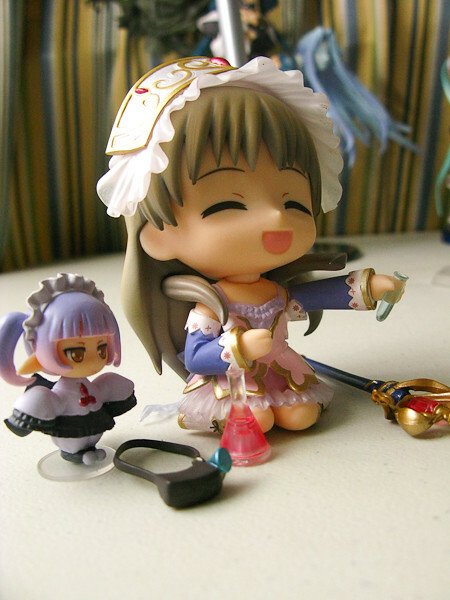 Totori really looks happy after being able to complete an item of mass destruction right there. 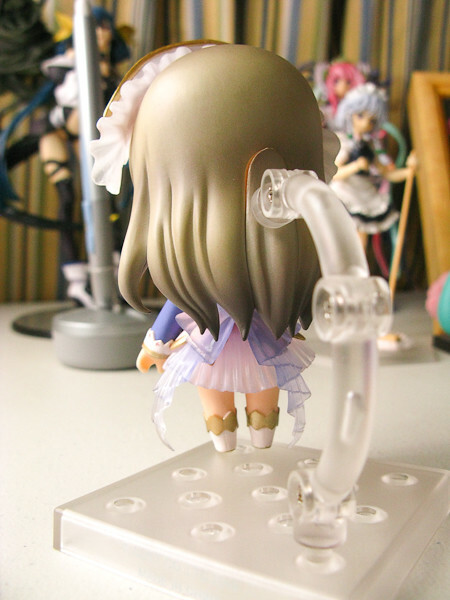 Totori also comes with two test tubes (pink and blue), an Erlenmayer flask (pink), another back ribbon part to portray her either sitting down or the wind at her back, waist/leg parts for sitting down (which I think Toko Amano nendo should’ve used) another set of straight and bent arms, and a crying face. Sometimes doing alchemy isn’ easy. It requires lots and lots of trial and error and it can lead you to just break down, now if you had help it’ll be an entirely different story. 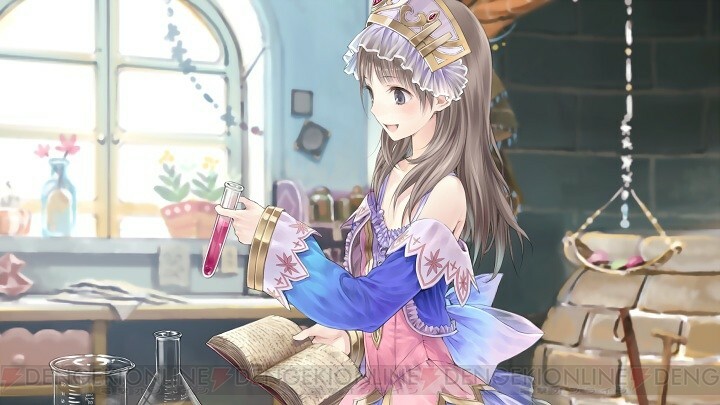 With the arrival of Hom, alchemy should be easier than before, and our heroine finally finishes that mixture of hers! 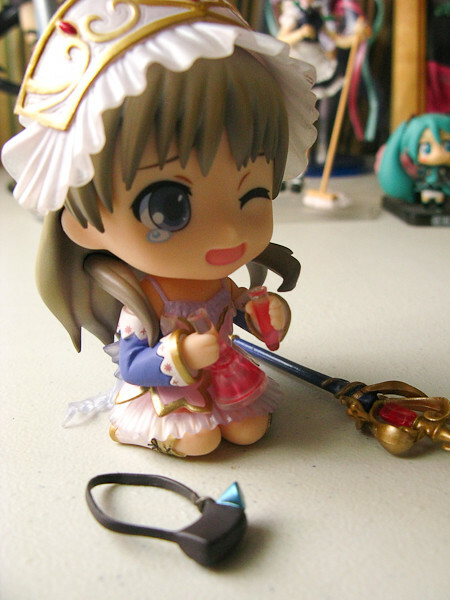 Our little homunculus deserves a pat on the head right there. Oh yeah, Hom has a male form, but I guess GSC decided that the girl form would sell more so to avoid production costs, female it is. 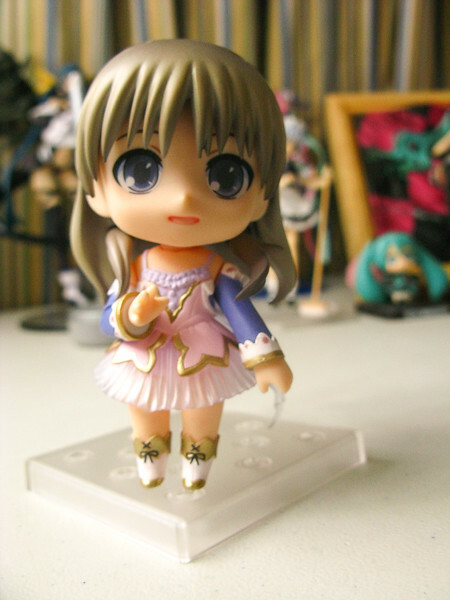 She’s posed like this on my shelf right now. 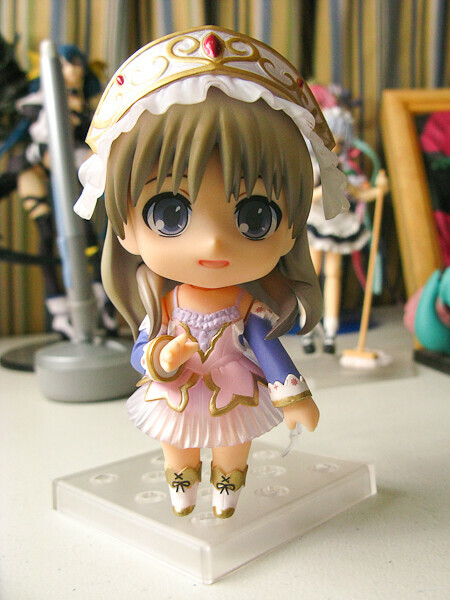 Glad I bought this one even if I’m not a fan of the atelier series (simply because I haven’t played it yet). 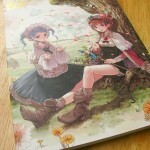 But I am a fan of Kishida-sensei’s works XD If you wanna check his artworks from the previous atelier series along with other artists do check this review of the Atelier Series Official Chronicle. 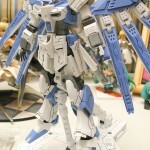 Hi-Nu Gundoom Review, Part 2 and Beyond! 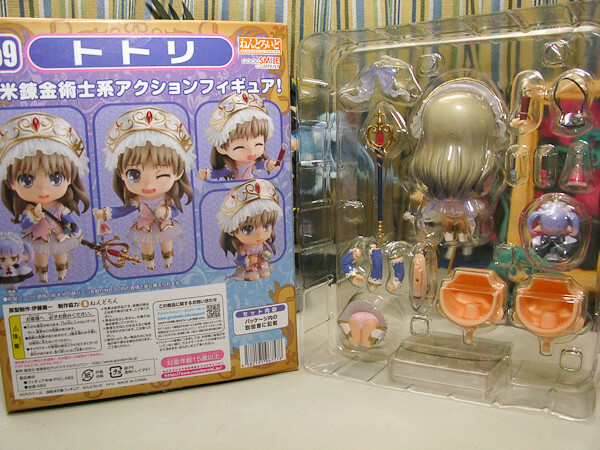 This entry was posted in Antique Content, Hobby and tagged Atelier series, atelier totori, good smile company, Gust, Nendoroid by admin. Bookmark the permalink. 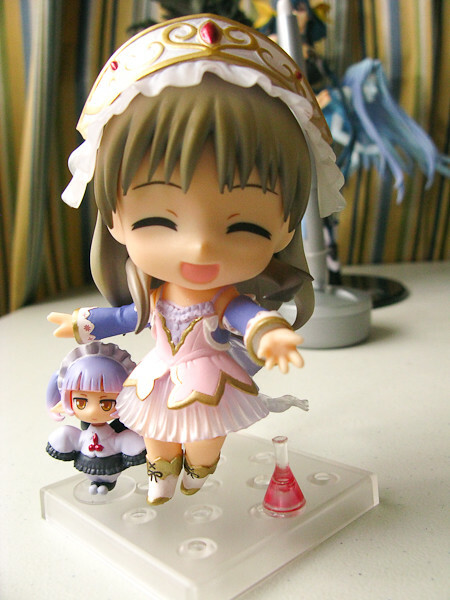 Totori looks great, I’m surprised GSC went a did a nendo of her since she comes from a relative niche series. I’m guessing the Atelier games are more popular in Japan than I think. Much like you I’m a fan of Kishida Mel’s art, in fact that’s what got me to play Rorona and make look forward to Totori and Meruru. 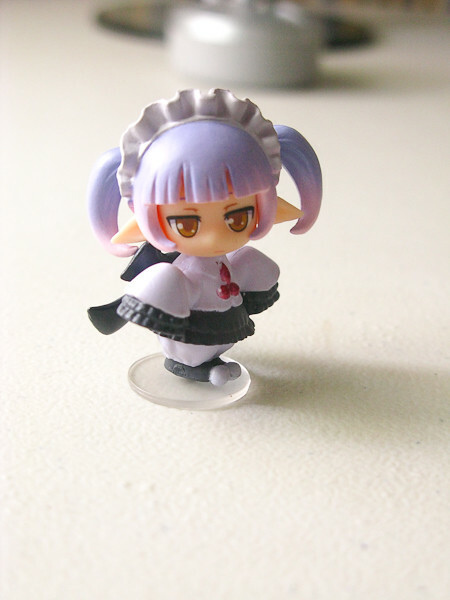 Georgeous nendo, im wondering why i didnt get her since she really ticks all the boxes of requirement mhmm. 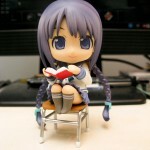 what would be great is if GSC did a1/8 version of her. 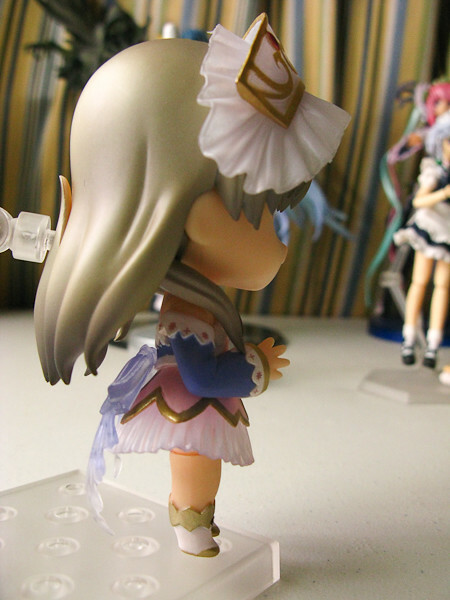 So much detail in this nendo. I love her! Also agreed about how soft her clothes look. Very adorable! These semi transparent parts are a big charm point of her beautiful dress. 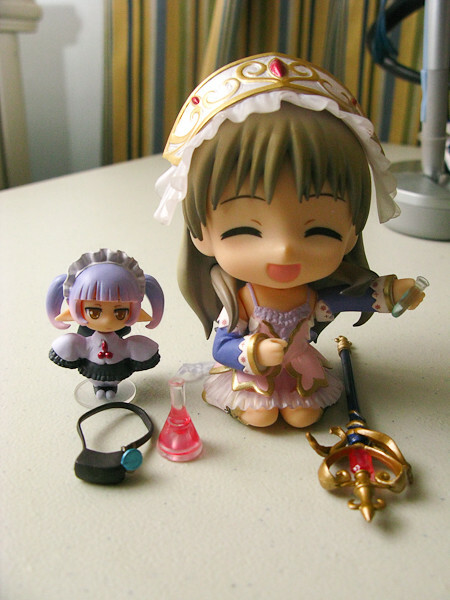 I really like the sitting pose of her and these faces looks enchanting and the test tubes are also lovely items. Good to see that they’ve used this kind of base, I like these more solid bases a lot. Also thx for adding that lovely illustration I haven’t seen that one until now. Hey its true =D Kishida’s art exactly does that hahaha. 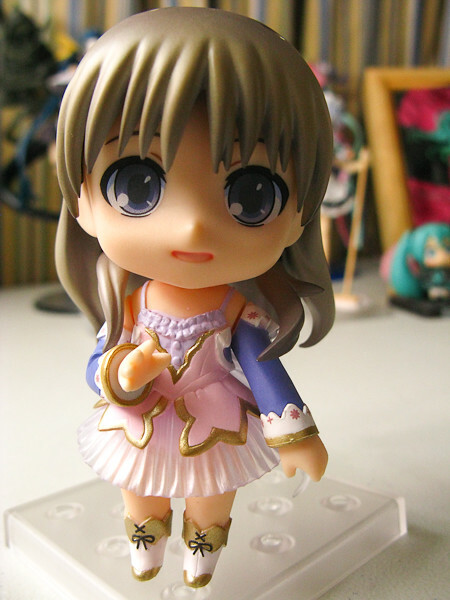 Awesomely cute nendo. How are the games too? I’ve never tried but I’ve always wanted to for the visuals.